Did you miss your last six-month checkup with your dentist? Perhaps you’ve let years go by without sitting in a dental chair. While you may be tempted to just stay away completely, there’s no better time than now to see the dentist. At Gilreath Family Dentistry, we make your visit comfortable and pleasant, regardless of how much time has lapsed. Here’s what you can expect. 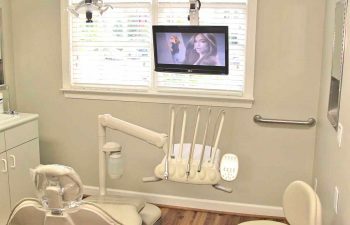 While we will always encourage patients to visit us every six months for optimal dental health, you’ll never find us judging your absence or making you feel guilty for not staying on top of your professional cleanings. The important thing is that you came now, so there’s really no need to lecture. Not every routine dental appointment includes x-rays. However, if it’s been a while since your last visit, you can typically expect some digital x-rays of your teeth, such as bite-wings, panoramic or other imaging type. This gives us the most accurate depiction of your oral health and allows us to see things that may be happening below the gum line or deep within the tooth. We always let you know what your insurance plan will or will not cover in terms of x-rays, and it’s ultimately up to you whether or not you want to have them done. Another task you can expect is a record or medical history update. Believe it or not, the health and condition of your body affects your oral health and may even influence how or if we perform certain procedures. Please let us know if there are changes since your last visit, including a new diagnosis, heart condition or pregnancy. Conditions such as diabetes may require an extra monitoring of your gum health, and your heart condition could mean that you need to take an antibiotic before your dental procedure. A professional cleaning is always included in a routine dental visit. If you’ve skipped your past visits, this may take additional time or you may find that we have to work a little harder to get stubborn plaque and tartar off of your teeth. (Hardened plaque cannot be removed with brushing at home – no matter how hard you try). Don’t worry; we have ways to keep you comfortable and relaxed if you are anxious about this part of your exam. Every visit, no matter how long it’s been since we’ve seen you, involves time to ask questions and discuss your concerns with Dr. Gilreath at the end. Therefore, it’s good to come well-prepared or even make a list of your concerns if it helps. This may include problems with teeth sensitivity, jaw pain that comes and goes or an interest in cosmetic dentistry. Feel like a stranger to the dental office? At Gilreath Family Dentistry, we can instantly make you feel at home again. In fact, we will welcome you back with open arms. If your dental visit does reveal an area of concern, rest assured that we can handle it right here!